The Invoice columns becomes visible. The Open Invoice link and Extract invoice rows commands, described below, are linked to the Invoice column (right click on the Invoice column's cell). In the Invoice column, press the F2 key; the list of open invoices will appear. If you type an invoice number or an account number, the list will be filtered based on the entered text. Select the required invoice and press Enter. The program will automatically complete the transaction with the description, debit or credit account and the amount. These data can also be modified manually. Apart from the date, you may also indicate the Customer account before pressing F2 in order to display the list of open invoices; in this case the list will be filtered, based on the Customers account of the transaction row. The list displayed in the Invoice column includes both the Customers' and Suppliers' invoices. A supplier's invoice may have the same number as the invoice of another supplier, because the criterion for display takes into consideration the invoice number besides the Supplier's account number. The Open Invoice link and Extract invoice rows commands, described hereunder, are linked to the Invoice column (right click on the Invoice column's cell). The Extract invoice rows command displays the transactions for the selected invoice. The command is available by clicking on the small blue symbol at the upper right corner of the cell or with the right mouse button. The Open Invoice link command provides the text, as defined in the Customers' settings (Account 2 - Customers - Settings - Advanced - Link to the Invoice document). In the command line, it is also possible to indicate other columns of the table by using their XML names. If the message 'File with extension considered unsecure' is displayed, add the extension (for example .doc) using the command Tools - Program Options, Advanced, File extension command. (If you don't see this option in the list, it means that this function has already been activated). An Address view, where the added columns are made visible. The columns that allow the insertion of the address data and other information. To display one or more of these columns, use the Columns setup command from the Data menu. To create other views with only selected columns, use the Tables setup command (Data menu). 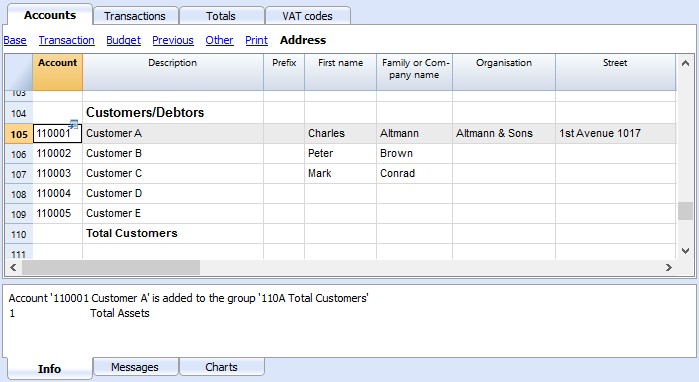 Select Accounts table, Address view and add the required information to the customers' accounts. To set / modify invoice expiration dates, you may intervene on three levels, where higher priority is given to the first one. Expiration data will be displayed in the payments schedule and printed out on the invoice document. 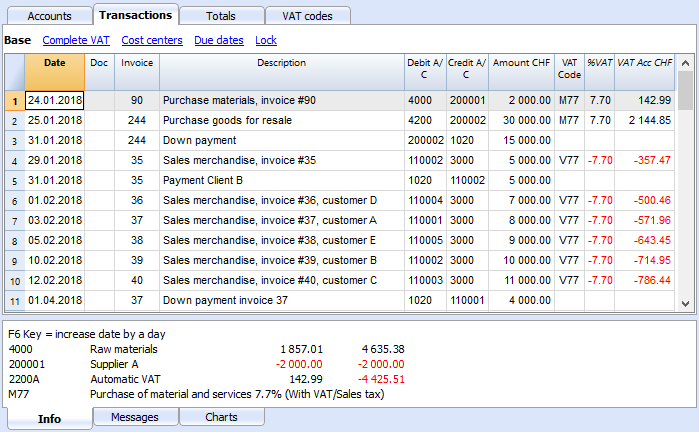 In the row of the Transactions table, where your invoice is entered, you will find an Date Exp. column when using the Due Date view. If a date is set up, it will have priority over dates set up on the 2nd or 3rd level. In order to set up an expiration date on a client level, for example +20 days after issuance of the invoice, select the account in the Accounts table, using the Address view, go to the Days Column (PaymentTermInDays) to set up the number of days to be used. Please indicate the group of the Chart of Accounts in which the different customers' accounts are grouped in "Group or account". For an explanation of the different options, go to Customers and Suppliers settings.